Samsung wants update the way we perform meetings with Samsung Flip. 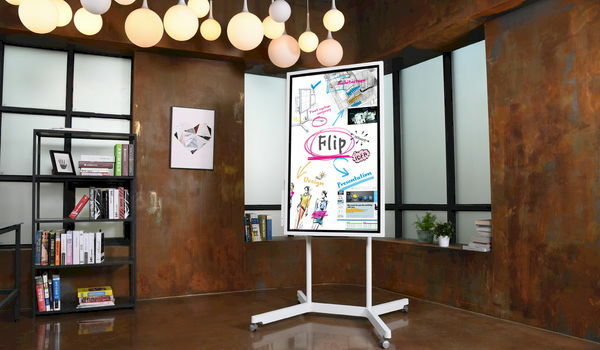 The company announced this digital whiteboard at the technology fair CES. With the platform, Samsung wishes to compete with Google Jamboard. The 55" 4K screen allows four people to draw on it at the same time and add content using their smart phone. The screen can be operated using your fingers or a special pen. And as the name suggests, you can 'flip' the screen, both horizontally and vertically. You can also just use the screen as a presentation screen by connecting your laptop to it. Would you like to have the innovative screen in your meeting room? Samsung has not yet announced the pricing but Flip will become available later in January, both in Europe and the US. To give you a slight indication: Google Jamboard will be sold at $ 4,999.